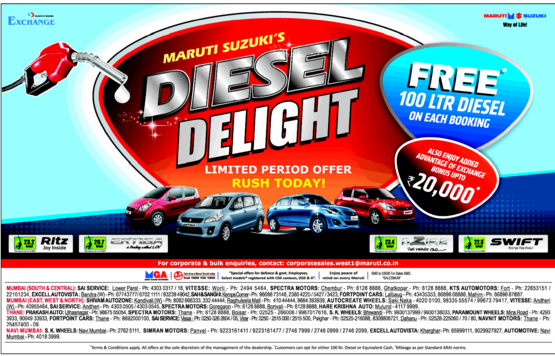 The slowdown in the Indian automotive Industry has brought the market leader, Maruti Suzuki offering discounts on its diesel range of best selling cars including Swift, Dzire, Ritz and even Ertiga. The cars esp. Swift and Dzire at one point of time used to sell with waiting period of 6 months. While it is yet to figured out that the discounts are being offered by the company or just the dealers, but seeing the discounts on best selling diesel models can surely let one know how much pressure the industry current is in. Until last month, the carmaker was offering a cash discount of Rs 5,000 on Swift and Dzire which is now converted into 100 Liters of Diesel. Additionally, Rs 20,000 of exchange bonus could make it a good deal. All the four cars are powered by Fiat's 1.3L Multijet engine with Swift, Dzire and Ritz delivering power output of 75 PS and Ertiga with 90PS.